A college buddy you haven’t heard from in years gives you a call to see if you want to do lunch. Heck yeah you would! Awesome that he thought to reach out to you. What began as a pleasant evening catching up with an old friend suddenly feels awkward. You feel . . . used. Because despite the growing ubiquity of glowing testimonials and aspirational lifestyle posts surrounding multi-level marketing, the reality of MLMs is quite different than it seems. If you, or your wife, is interested in joining one, you owe it to yourself to understand this other, darker, considerably bleaker, side of things. 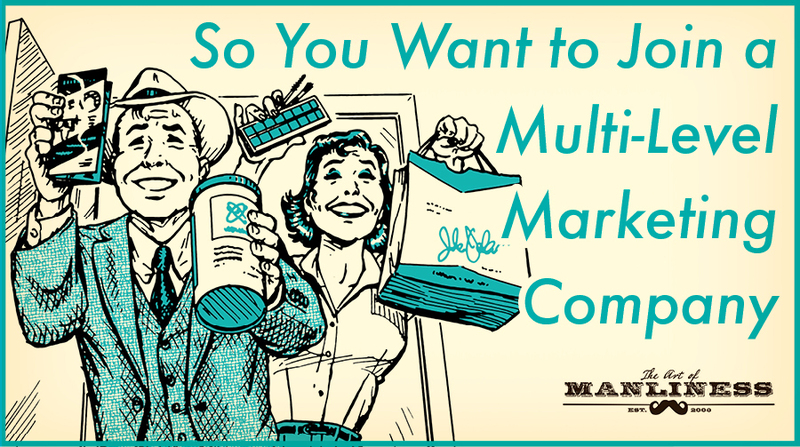 There are lots of definitions of what multi-level marketing is and it gets called different things. Consequently, it can sometimes be hard to tell, at least initially, whether a company fits that label or not. First, here are the different things you’ll hear multi-level marketing called: network marketing (most common), direct sales, affiliate marketing, referral marketing, dual-level marketing, consumer-direct marketing, home-based business franchising, home-based business opportunity, and inline marketing. Okay, so we know what terms might be used to talk about a business that uses multi-level marketing. How exactly does this business model work? This is an okay definition, but to really understand what an MLM is, you have to see it “in action.” Below I walk you through the functioning of a hypothetical MLM called Company A. While every MLM differs slightly in how they work, they all share this same basic format. Company A sells weight loss shakes. Instead of putting them on store shelves or selling them direct to consumers through an online store, they recruit sales people called “distributors” to sell the shakes for them. To become a distributor, a person needs to buy a distributor starter pack from Company A. It costs $75 and contains brochures about the product and what distributors can do to make money with the company. It also contains a few samples of the product that the potential distributor can give away in order to help sell the product. Jim fills out the application to become a distributor for Company A and buys the $75 starter kit. Jim can now buy Company A’s shakes at a 25% discount and sell them to friends and family at the full retail price and keep the profit. This is pretty cool. Jim gets signed up for an auto delivery system where his credit card is charged a $100 a month and he’s sent product every month. He’s kind of worried about this $100 recurring charge, but the shakes will sell themselves, right? He’ll be able to make his money back. Definitely. Jim starts pitching the shakes to his friends and family members. He gets a sale (from his mom), but that’s it. Most people are just plain uninterested. Selling these shakes is a lot harder than he thought it’d be. Incentives to recruit new distributors into the company. Jim earns a commission on the product the distributors below him buy from the parent company. Advancement in the sales hierarchy is achieved by recruitment rather than by appointment. Jim can’t get to the next level in the sales hierarchy by someone above him saying “We think you’d be a good executive distributor.” It’s only determined by the number of people he recruits and that his sub-recruits recruit. “Pay to play” requirements are met by ongoing “incentivized purchases” and/or recruitment minimums, with participants the primary buyers. To become a distributor, Jim had to buy a starter kit. To maintain his status as a distributor, he’s required to make minimum monthly purchases. Arguably the most defining feature of an MLM is that the main customers of the company’s products are not unassociated folks outside the company, but the distributors within it. If the products are as amazing as the MLM parent companies claim they are, they should do well sitting next to other products on physical and virtual shelves. If the products really had a competitive advantage, the company would want to make them available to the widest possible marketplace and consumer base. MLM companies ultimately don’t have a strong incentive to make their products uniquely the best, because, remember, their main customers aren’t those outside the company, who they need to impress, but distributors who already work within the MLM and are required to buy their products. I can see this actually being a legit argument for joining an MLM; if you like a certain brand and use it frequently enough, getting the 25% discount for being part of the MLM might be worth it. But you have to ask yourself, is it possible to get a similar quality product outside of the MLM for cheaper than the discount I’d get for being a part of the MLM? For example, I compared the cost per serving of Advocare’s whey protein ($2.55 per serving) to the whey protein I buy from Bodybuilding.com ($0.85 per serving). Even with Advocare’s member discount, the Cellucor whey protein that I buy at retail is cheaper (and likely about the same quality, as just explained above). You’ll find the same thing for most other products that an MLM sells. Essential oils, make-up, kitchen products, candles, leggings, you name it. And here’s the thing. I don’t have to pay a monthly fee or buy a minimum amount of whey protein from Bodybuilding.com to get the affordable price I pay. I just buy it when I need it. But with an MLM, I’d have to buy a certain amount of whey protein (or pay a monthly fee) to stay qualified for my not-so-great discount, even if I personally didn’t need to buy more whey protein. Bottom line: if you joined an MLM just to get a discount, you’re probably not actually saving money. It’s better to be able to buy only what you need, when you need it, and to comparison shop like any other savvy consumer. Wait. This Sounds Like a Pyramid Scheme. I Thought Pyramid Schemes Were Illegal? For those of you who don’t know what a pyramid scheme is, it’s an illegal business model in which investors are promised large profits based primarily on recruiting others to join their program, rather than the real sale of goods to consumers. I got one of these when I was kid back in the early 90s. Instead of $1, you were supposed to send out a baseball card. In theory, you were supposed to receive like ten thousand free baseball cards back in return. I never got a single one back though. Again, the real customers in an MLM are the people inside the MLM. So if our hypothetical MLM works an awful lot like a pyramid scheme, why isn’t it illegal? It’s all due to a legal technicality, which you can read about in detail here. Thus, MLMs are able to operate exactly like an illegal pyramid scheme without technically being categorized as such. If MLMs Are Basically Legal Pyramid Schemes, How Have Some Lasted So Long and Grown to Billion Dollar Companies? So if MLMs are essentially legal pyramid schemes, how have companies like Herbalife or Advocare continued to grow and expand? Yes, most businesses and corporations have a structure that looks like a pyramid. There’s a CEO at the top, with several VPs below him, and the VPs each have several managers below them, and the managers have several employees below them. What’s more, when you’re working at Walmart, the manager above you isn’t constantly pressuring you to recruit your friends and family members to work for Walmart. If you’re part of an MLM, you’re going to get that pressure. So while the corporate structure of Walmart (or any other legitimate business) is shaped like a pyramid, it’s not a pyramid scheme in the way that an MLM is. Direct sales have been a big part of the American economy for centuries; Yankee peddlers and door-to-door vacuum salesmen are classic American archetypes, and legitimate direct selling continues to go on today in the form of dudes who canvas neighborhoods pitching pesticide treatment, satellite dishes, home security systems, etc. At first blush, MLMs do seem to follow this same model. They’re selling products directly to the consumer. The difference between true direct sellers and MLMs is that the main customers for the latter aren’t those outside the company, but those within it. This is indeed how franchises work. You have to pay the parent company a fee to operate a franchise and buy product directly from them to maintain it. But there are some big differences between traditional franchise businesses (McDonald’s, Taco Bell, GNC, KFC, etc.) and MLMs. First big difference: the parent company takes extreme caution that a market doesn’t become overly saturated with franchises. That’s why MLMs can afford to ignore the principle of supply and demand: you can have 100 ladies selling make-up in the same town because they’re not actually trying to sell make-up to outside consumers; they’re trying to get as many sales reps in their “downline” as possible. So, while there are hints of similarities between an MLM and a bona fide franchise, they’re definitely not the same thing. Hopefully, I’ve made the case that while not technically illegal, multi-level marketing is based on an unsustainable, ethically-questionable business structure that will eventually result in the collapse of the enterprise. But maybe you’re not overly concerned about the questionable business model, or a company’s long-term prospects. You just want to make some money and you’re more focused on what you might get out of joining an MLM in the here and now. As we said at the start, three-fourths of multi-level marketers are women. Why? First, MLM companies typically sell products that appeal to women: make-up, weight loss supplements, eyelash extensions, skincare products, essential oils, etc. Second, women tend to have a wider, stronger social network than men, and thus a more effective conduit to facilitate sales and recruitment. Most importantly, however, is that MLMs are attractive to women who are moms and want to find a way to make some extra cash while still being able to stay home with their kids. For these women, multi-level marketing can seem like exactly the opportunity they’re looking for — a chance to earn income and be stay-at-home mothers. It’s a stay-at-home mom’s dream come true. What distributors recruiting people into the company won’t tell you (and what the parent company does a good job of keeping out of the limelight), is that most people who sign up for an MLM receive zero to just a few hundred dollars in commission checks a year from the company. And by most, I mean 90-99% of all distributors of an MLM. That’s the conclusion that consumer advocate Jon Taylor came to after analyzing over 600 MLM compensation disclosure statements. You can do the same analysis yourself by looking at the income disclosure statements of companies like Herbalife, Advocare, Rodan+Fields, and DoTerra. It’s perfectly true that you might succeed. It’s definitely in the realm of possibility. But it’s not probable — as even the MLM companies reluctantly admit in their own financial disclosures. Why isn’t it probable? Not because people are lazy. It’s because of the way MLMs work. Remember, while not legally a pyramid scheme, MLMs effectively operate like one. To make money on a pyramid scheme, you got to get in on it early. You’ve got to be at the top. If you are, yes, you can make good money. But if you’re a latecomer and are at the bottom of the chain — and the vast majority of people will be — the chances of you making money is almost zero, because it’s going to be extremely difficult if not impossible to recruit enough people beneath you to generate a good income. There’s a chance, but it’s a slim one. There’s also a chance you can win the $500 million Powerball, but no financial adviser in their right mind would tell someone to buy $100 worth of lottery tickets a month so they’d have the “opportunity” to secure their financial future with a jackpot. Ultimately, the dream of attaining a hefty passive income is far more mirage than reality. An MLMer is far more likely (on the order of 1-9% vs 90-99%) to lose money than to make it. All these options obviously have their own downsides, but they offer guaranteed incomes or honest-to-goodness entrepreneurial opportunities that your wife can fully own and control herself, allowing her to truly claim the title #bossbabe. When you read the testimonials of women who belong to multi-level marketing companies, a lot of them talk about how it’s been a great way to make new friends. In a society that’s becoming increasingly isolated and lonely, this is a big draw. Unfortunately, these MLM “friends” typically don’t turn out to be genuine or to last. Your wife’s likely just a commission payment to those in her “upline.” If she decided to stop being part of the MLM, those “friends” will probably stop interacting with her. What’s worse, by belonging to an MLM, your wife will likely alienate herself from her real friends and family. Your friends will find hearing, and rejecting, your pitches awkward. They’ll stop returning your phone calls. They won’t ask you to hang out anymore. Co-workers that you were once chummy with will try to avoid meeting you at the water cooler. Family get-togethers will develop a weird tension. Even if you successfully recruit a parent or sibling to become distributors, you may fight over who’s got dibs on recruiting a mutual friend or family member, and who gets the credit for turning them into a distributor. And let’s say you do succeed in getting someone to join. What happens to your relationship when they fail and lose money (which they’re almost guaranteed to do)? Well, they probably won’t want to be friends with you anymore. They’ll understandably feel used. MLM Unmasked by Jon M. Taylor. Taylor lost a lot of money and nearly his marriage being a rep for NuSkin, a multi-level marketing company. He’s since become a consumer advocate warning people about MLMs. His free ebook MLM Unmasked is very informative. Talented Ladies Club. They’ve taken pretty much every MLM out there and done an analysis on how much money you can actually make. Answer: not much. Betting on Zero. Documentary about hedge fund manager Bill Ackmans’s billion dollar short on Herbalife stock. Does a good job explaining how MLMs work. This Week Tonight on MLMs. Segment by John Oliver on MLMs. A bit crass and smug, but an accessible intro to MLMs. Quartz article on MLMs geared towards women. Bloomberg article on LuLaroe and MLMs in general. Google is your friend. Just search “can you make money with [insert MLM]” and you’ll find lots of detailed and thorough reports on how and why people usually lose money working for that company.